ISLAMABAD: The National Accountability Bureau (NAB) on Tuesday recommended placing former prime minister and Pakistan Muslim League-Nawaz (PML-N) leader Shahid Khaqan Abbasi’s name on the Exit Control List (ECL). Following approval from the NAB Rawalpindi DG Ifran Naeem Mangi, the anti-graft watchdog wrote a letter to the Ministry of Interior in this regard and requested that the name of former premier be placed on the ECL in connection to an ongoing probe pertaining to the liquefied natural gas (LNG) contract case. “Shahid Khaqan Abbasi is named in an LNG contract case which is being probed, thus his name should be placed on the ECL,” the letter states. Earlier in the day, the former premier appeared before NAB Rawalpindi after his petition for 15-day exemption from appearances was rejected by the anti-graft body. Some media outlets reported that Abbasi failed to bring the required documents in the case along with him. Reportedly, Abbasi told the NAB team that he needs more time to get the required documents. The former premier also lauded Supreme Court’s (SC) decision of granting bail to PML-N supremo Nawaz Sharif “despite attempts by Punjab and federal governments”. He said that the apex court had granted relief to the former premier for medical treatment. “The court has granted relief to Nawaz for medical treatment. I want to thank friends and workers of PML-N who continuously prayed for Nawaz’s health,” he said. 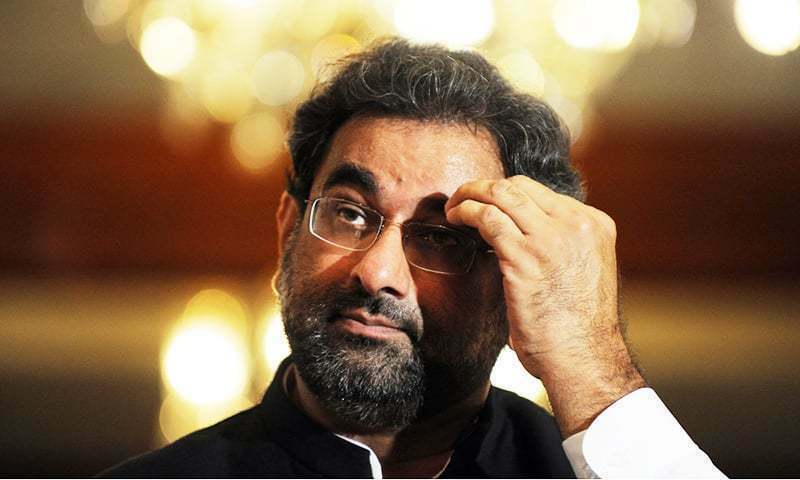 Abbasi pointed out that the court’s decision had exposed the lies of the prime minister and his ministers. “Despite attempts by the Punjab and federal governments, the court has granted Nawaz relief for treatment. This has exposed the lies of the prime minister and his ministers,” he said. “It was brought on record today that Nawaz’s health is in danger and that he never refused medical treatment,” he added. Lashing out at the Pakistan Tehreek-e-Insaf (PTI) government for its attitude towards Nawaz’s health, the former premier said that the government “should at least be ashamed of itself for showing such pettiness”. NAB is probing a case instituted against Abbasi in 2015 for allegedly awarding an LNG import contract at exorbitant rates, which caused a potential $2 billion loss to the national exchequer.